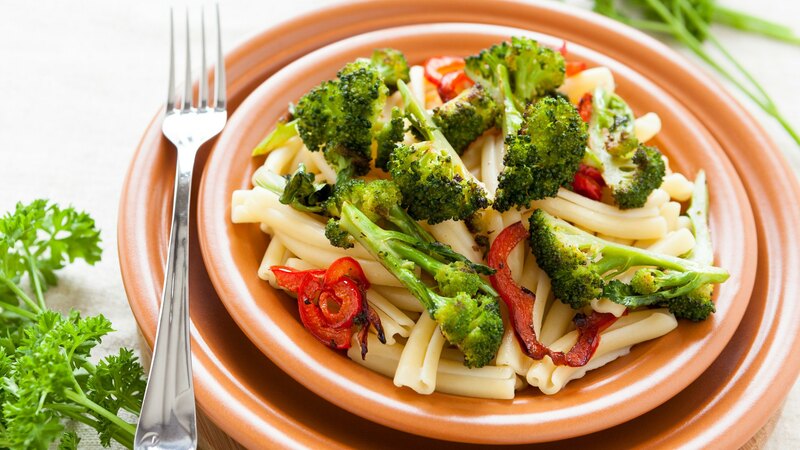 This penne with broccoli recipe is a super fast, one-dish meal that everyone will enjoy. You can use orange or yellow peppers as you wish, but stay away from green; they’re slightly bitter and won’t enhance the recipe. Bring a large pot of salted water to a boil and cook the pasta. While the pasta is cooking, heat the oil over medium heat in a large skillet. Add the minced or sliced garlic and the black pepper, and toss until just fragrant — about 30 seconds. Add the broccoli, bell peppers, orange juice, and soy sauce, and cook until the broccoli begins to brighten in color and is almost tender. If it gets too dry or sticks, add some of the pasta cooking water. Add the scallions and nuts and heat through. Drain the pasta and toss with the broccoli. This is a great vegetarian dish, but people who want more protein in their diet can add in some cooked chicken breast. If you still want it to be vegetarian, add some baked tofu.